I hope you are doing well and you do not suffer too much from the strong winter in Europe. I also think of the poor animals outdoors. 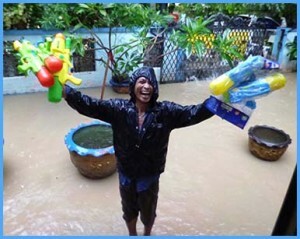 I have made a video of the never-ending rainy season and Sven from Berlin took great care to cut it for you. 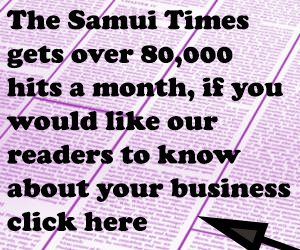 Normally, the rainy season in Samui starts in October and goes to mid-December. In December the high season begins and the tourists come in droves. This year they have also come and have certainly experienced an unforgettable holiday, since it has rained almost without a break from the beginning of December and on some days even the state of emergency was called out. Many flights were cancelled and the ring road was flooded so high in some places, that the only way to pass it was by boats. The road across the mountains from Lamai to Maenam was no longer passable because the road no longer existed in many places. Many tourists have left the island (which was not so easy) as they realized what was happening here. The weather forecasts never promised good. Either a storm should come or rain without an end with thunderstorms. The weather frog was always right. Unfortunately, visitors were hardly able to come to visit our house in Chaweng, because our house was surrounded by a huge lake, not only daytimes, for almost 6 weeks. 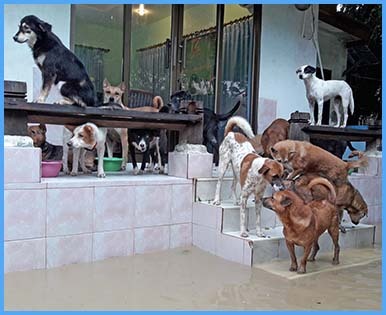 To get to the animal shelter in Ban Taling Nam was also hardly possible due to the flooded streets and animal friends could not look at the animal shelter and get informed about our work. The storms of course have again caused a lot of damage and we do not know where we should start with the urgently needed repair works. Two other huts were destroyed again. A palm has fallen over the huts. All dogs were able to run away on time. The rain is not a big problem in the shelter, because we have a strong descent and the water flows off very quickly. After these poor months of October and November (low season), of course, everyone waited for the high season. We, of course, either did. But that has unfortunately fallen into the water and our big hopes for donations have lapsed. Please help us to swim out of the “rain hole” and support us with a small donation. Please do not let us down in the future. 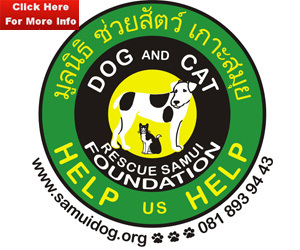 Dogs and cats need your help. P.s . : Werner is still at the hospital in Bangkok, but he is now on the way to recovery. Unfortunately, it is still unclear when the breathing tube can be removed, because he can’t swallow properly. It can then happen that food gets into the air tube and causes a lung inflammation. He had this already twice in the last 2 months. In addition, blisters and kidney stones appeared which still have to be treated.